My 'Bart ' biplane from the July 1998 Aeromodeller free 'Pete' plan. Construction is all balsa with Jedelsky wings and part profile fuselage, sheet tail and fin. 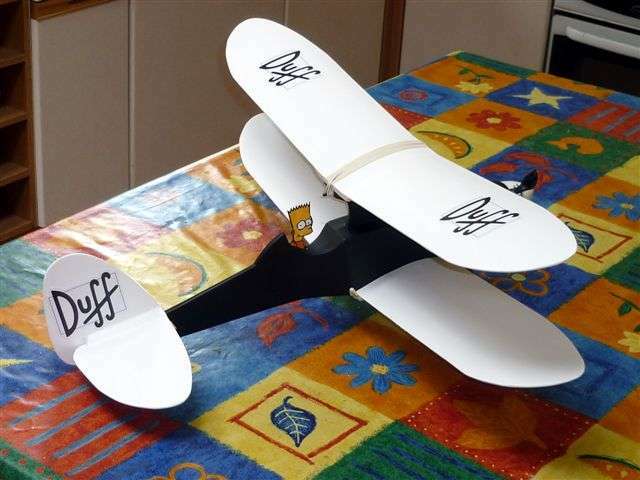 Just waiting for some B-ART fuselage stickers to arrive and then I will test fly this weekend. I may change the elastic band wing secure system to magnets later on for a more neater look. I continue to use my standard proven brushless 2500kv Ebay motor running a Pboro Fet timer /servo tester circuit on a 7 x 4 inch folder and 2 cells lipo 500ma. Auw flying is 15.9 ozs. 'BART ' has a much bigger wing area than my earlier Roaring 20 so it should be a real floater.